My friend Jennifer recently celebrated her birthday. I decided that I needed to make her an apron. I didn't really know how to make an apron, but it seemed easy enough. I searched online for free patterns and found this one. And then I took the liberty of not really following it. I knew I wanted a stationary neck strap rather than ribbon so I cut a 4 x 30 inch length of striped fabric, folded it in half lengthwise (print side out), ironed it, and then tucked both raw edges under 1/2 inch, ironed over those, and then zigzag stitched the edge closed. I didn't make a pocket. It seemed unnecessary. Cut the ruffle fabric longer than the fabric you will join it to, so that you get lots of ruffles. (In my case I cut a 3" x 44" strip. Hem the length of one edge of the strip. For the other (raw) edge, change your machine setting to a wide zigzag stitch. Fold a hem. Lay a string (I used embossing thread) on the middle of the hem, centered under the presser foot. Zigzag over the string, but don't hit the string with the stitches. The presser foot should have a little space that will keep the string in the middle as you go. When you reach the end, pull on the end of the string to gently to create ruffles. Be careful not to pull the other end of the string through. Pin each of the ends of the ruffle to the ends of the under side of the apron, then another pin in the middle and then pin in the middle of the end and the center. Stitch the ruffle to the apron, making sure your ruffles stay ruffly as you go. Yay, a ruffle! 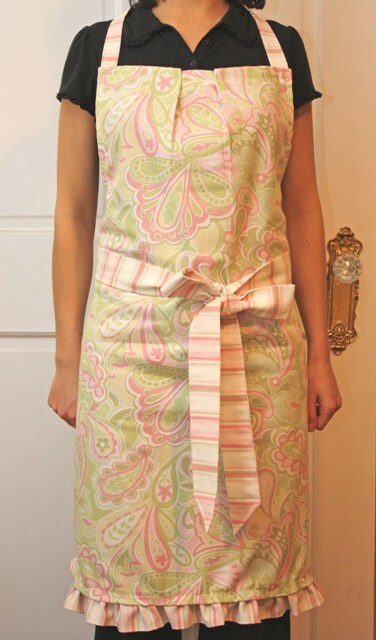 When I was done and tried on the apron, I noticed that the top edge of the apron was wider than it needed to be. Since I had already connected the neck straps I wasn't sure what to do to fix it. I decided to sew two darts in the middle of the fabric. It successfully made the top a little narrower and gave it a little more (womanly) shape. This is awesome -- you should totally open an Etsy store! Seriously, I love internet sewing tutorials. With my mom as my great sewing teacher over the phone, and people's sewing blogs, I taught myself how to install a zipper, do gathers, add rickrack, sew on a button etc. Although my seam ripper and I are on the closest of love/hate relations...This apron looks awesome!